When the transaxle and ATF are hot they could cause severe burns. Turn off the engine and wait until they are cool before changing ATF. Usually let cool for 5-7 minutes. If you are experiencing overheating issues you might need to let it sit for a few minutes longer. Fluid should be checked when its temperature is between 150F-170F. (66C-77C). This is still hot enough to burn you so use caution and wear proper protective gloves. 3. Ensure all sealant residue is cleaned from the bolt and bolt hole (if applicable). 4. Remove drain plug (bottom of transmission) and catch ATF in pan. 5. Replace drain plug and torque to 11-26 ft lbs (hand tight). 6. Add specificied type of ATF (Dexron II or Mercon III) through the transmission fluid filler tube until ATF level reaches lower notch of dipstick. The leveling port/plug is so that it is impossible to overfill the transmission. 7. When fluid comes out of the level port then you have reached maximum fluid level. 8. Install fluid level plug and torque to 11-26 ft lbs (hand tight). 9. Install dipstick and verify level. Is this for the mazda 626 4 cylinder 2002 version ??? Though almost 2 years later.... this applies to almost every vehicle out there, that has an automatic transmission. Though in my own opinion, I would replace the transmission filter as well, which involves removing the transmission "pan" and removing old filter, replacing it with new one, putting a new gasket (or use Permatex sealant (red or blue)) and then rebolt the transmission pan. My step would be between 4 and 5 above, so 4.5 . The rest is the same as DJDevon points out above. Okay, just discovered location of filter is not inside pan, so ignore this post, lol. Hi Devon. Mine is 1999 Mazda 626 LX 2.0 4 Cyl. One question, can you show me in the attached diagram where the transmission level plug is located at? 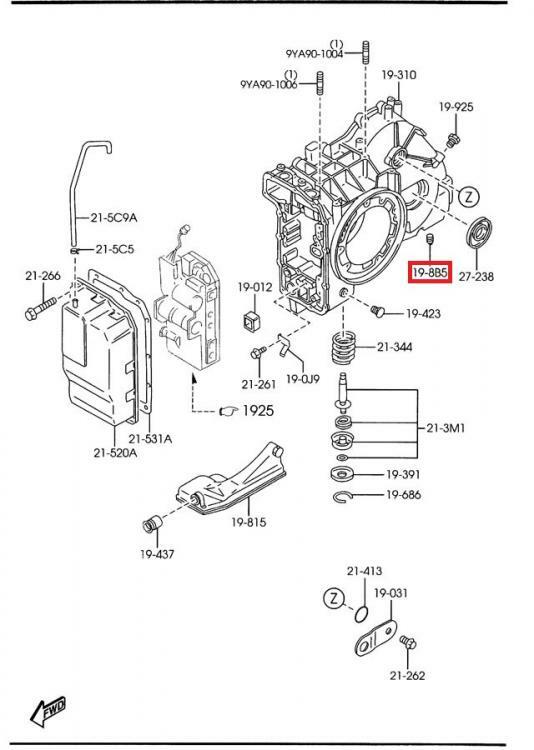 Or at least the Mazda OEM part number to locate it in the dealer's catalog. I already found what I believe is the drain plug (red rectangle in the picture) and found out that its part number is FW51198B5. Thanks in advance! 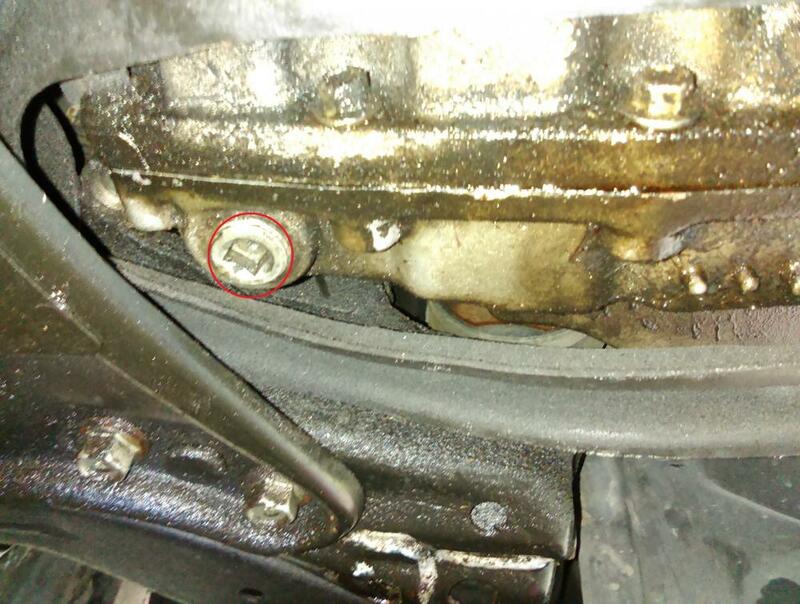 Could someone confirm whether the thing I circled in red in the attached photo is the automatic transmission fluid drain plug? I can now confirm that it is the drain plug for the transmission fluid. You can turn it with a 3/8" drive socket wrench. I first tried turning it with a "stubby" socket wrench that I had, but I didn't have enough leverage. A 13 1/2" socket wrench worked just fine.